If there’s one thing Phoenix is known for, it’s our exceptionally hot summers. Staying cool is a constant battle, and with energy bills going up year after year, it’s important to find ways to beat the heat on the cheap. With that in mind, we’ve gathered ten simple ways that you can keep your energy bills low and your home cool this summer. If you’re in need of air conditioning service, call Integrity AC and Heating. One of the biggest sources of energy loss in households across the country stems from cracks throughout the house leaking out cooled and heated air. All it takes is some caulk and weather-stripping to seal those cracks and you can cut down on the impact leaks have on your energy costs. In fact, Consumer Reports said that sealing leaks can reduce your energy costs by 15 to 30 percent. You can hire a professional to perform an energy audit on your home to pinpoint these problem areas if you’re unsure of where you should focus your efforts. While it might seem obvious, you would be surprised at how big an impact your oven, dryer, and dishwasher have on your home’s overall temperature. When the temperature in your home is high, your HVAC system will have to work harder to bring it down to your desired level. When it works harder, your energy bills will naturally rise in kind. Keep your baking, laundry, and dishwashing after the sun sets to prevent your home’s temperature from rising too high. When it comes to getting things clean, many people automatically think that the hotter the water, the cleaner everything gets. However, when it comes to laundry, cold water can get the job done just fine. You can save a not-insignificant amount on your energy bills by switching over to cold water from hot, without sacrificing the cleanliness you’re looking for. Many laundry detergents have been developed and released in recent years specifically for use in cold water, with more and more people learning the power of washing clothes in cold water. As we touched on previously, preheating an oven takes a lot of energy and puts out a great deal of heat. Instead, try slow cooking your meals in a crockpot. Not only do they use less energy than an oven or stovetop, they have much less impact on your home’s overall temperature. While the past of the crock pot may have been filled with bland food, many people have been putting out delicious recipes that take advantage of slow cooking. If you need to do laundry during the day, you can use the power of the wind to dry your clothes instead of heating up your house with your dryer. Some people have reported that switching to line drying their laundry reduces their energy bills by up to $75 a month, so you can see how that adds up over the year. While it may not be possible for you to put up a clothesline with how much room you have in your yard, you can still take advantage of air drying by hanging up your clothes with hangers. Depending on how your laundry room is set up, you might have enough room to do it in there, while some others might find better success hanging the clothes from the rod in their shower. Just make sure you’re not doing this over a carpeted surface since the clothes will likely drip water down. It’s best to keep this reserved to tile or linoleum-floored rooms. 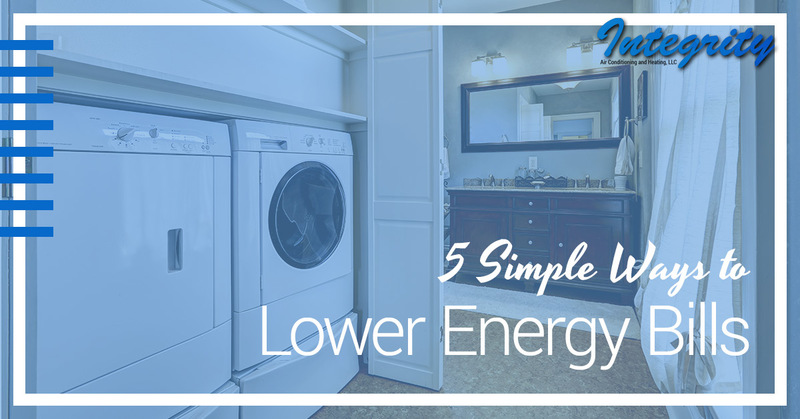 We’re going to be diving into five more ways to lower your energy bills in the near future, so keep an eye on this blog for that. We hope that you have found this an informative resource, allowing you to cut your energy bills down significantly without making many changes to your day-to-day life. One of the biggest ways to ensure your home stays cool without raising your energy bills is with a properly functioning HVAC system. With some cleaning and maintenance, you can ensure your air conditioning keeps running strong all summer long. Call Integrity AC and Heating today to schedule your appointment!